Naseem Hamed - the hard punching southpaw featherweight sensation from steel town Sheffield, adorned in leopard design trunks, who somersaulted the top rope. Unorthodox punches delivered by him from all angles with hands often held deceptively and casually low, belying cat like reflexes. A record of 37 fights, 31 KO's, with only one points loss to Marco Antonio Barrera, a fellow leftie, who'd been converted to orthodox stance. He was inducted into the International Boxing Hall of Fame in 2015. 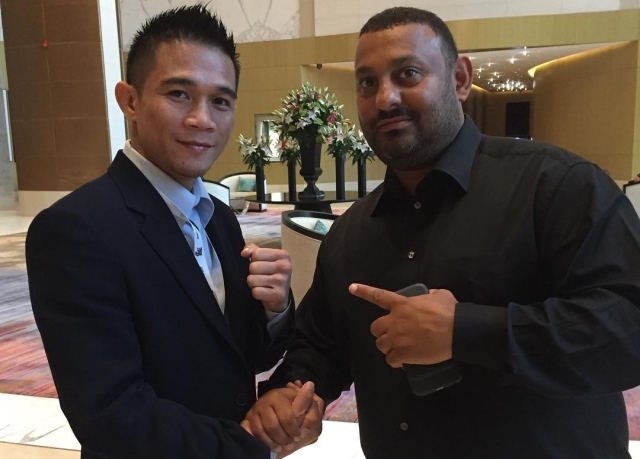 Caught up with the brilliant and unorthodox one, at the World Boxing Council's fifty fifth Convention in Baku, Azerbaijan to ask? WBC: There are a lot of great boxers now, but no one flamboyant and spectacular like you? Naz: I honestly feel we have that lacking [in boxing]. No one will put it on the line like I did. It'd be nice to see someone really entertaining, doing the job I did and filling those shoes. But unfortunately, we haven't seen that for a number of years. WBC: Why did you bring this excitement to the ring? Few were neutral...they either loved or hated you. Naz: I brought the excitement because I wanted to be one of the best fighters in the world, I wanted to be the most entertaining fighter in the world and I wanted to put my stamp on the sport. And I honestly think I achieved all of those things. Today I sit in The Hall of Fame, with the likes of Muhammad Ali, and I'm here at the 55th WBC convention, invited by the WBC President and the green and gold means so much to me. To win it was always a dream of mine. It's an amazing belt. WBC: One of the marks of a great champion is to be able to finish a fight with one big punch, and you had that. Naz: I had knockout power in each hand. I was blessed not only with confidence in abundance, but power, and I thank God for that. WBC: Are you born with this power, or do you develop it? Naz: I think there are different forms of knockout power. When you see guys like Mike Tyson and Julian Jackson, you know they were blessed with something. It's a certain snap to the punch. It's a certain kind of power that you very rarely see. On the Monopoly board, we call that the get out of jail card. Even if it got to the late rounds...I KO'd Paul Ingle in the eleventh. It's nice to possess that power and to take them out at any stage of the fight. WBC: What is it like to be here at the WBC convention? Naz: I'm humbled by the fact that there are so many world champions, former world champions. I'm humble to be in the same room. I see many fighters here who were possibly better than me...and I'm not too shy to admit that. I just congratulated them on what they did in their careers. It's amazing to see! [QUOTE=millcitymauler;18114268]You should delete this before everyone sees it[/QUOTE] Keep you head in the sand...chump.